I am a huge fan of Strictly Come Dancing and I know I am not alone. Strictly themed gifts always feature on my Christmas shopping list, from my Mum to my niece they all love a Strictly present. 1 I visited the Blackpool Tower Ballroom last year to celebrate my parents 50th wedding anniversary, it is a breathtaking site. Why not make it something special and buy a gift voucher to enjoy Afternoon Tea at Blackpool Tower Ballroom it is a fabulous experience and just £40 for 2 people. 2 There is nothing like seeing the professionals dancing live, along with your favourite celebrity dancer. Treat yourself and a loved one to a Tickets to Strictly Come Dancing Live Tour (prices vary), I had a splendid time last year when I saw the show at Birmingham. We did splash out and have full hospitality for the day, meal, drinks and excellent seats for the show. 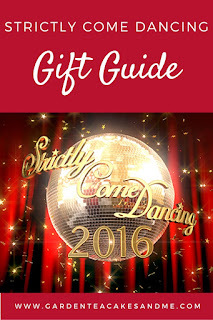 3 Looking for something easier on the pocket, then the Official Strictly Come Dancing Annual is perfect for fans young or old. Full of interesting facts and fabulous photographs of each year's celebrity and professional dancers. You can get the 2016 annual at a bargain price, the 2017 album is due out at the end of October but you can pre-order it now. 4 What fun you will have whilst watching Strictly with some Strictly Come Dancing Celebrity Face Masks , pick your favourite, we even took them with us when we went to watch the Live Tour. Everyone wanted to be head judge Len - boo hoo it's his last year, we will all miss Len! 5 A chance to enjoy the show even when the Strictly season has finished on the tv, take some time out and enjoy solving (5) Ravensburger's Strictly Come Dancing Jigsaw Puzzle (1000 Pieces). 6 If you fancy having a touch of Strictly Come Dancing with you every day then the Official Strictly Come Dancing Calendar , is perfect to keep track of those essential appointments. The 2017 calendar is available for pre-order. We all have our favourite dancing couples, in 2016 I cheered on on Anton De Beke and Kaitie Derham, although I did have a soft spot for Jay and Aliona. I am still not sure who I want to win in 2017, although I have pulled out Judge Rinder in the family sweep! Do you love Strictly? Who is your favourite for this year?